MCW Architects have completed the transformation of a Victorian Farm, the Stapleford Granary near Cambridge, into a music and arts venue. The ACE Foundation is a Cambridge based charity with the aim of encouraging and developing cultural understanding. 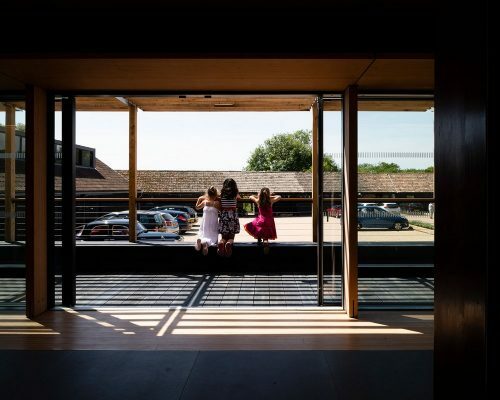 Providing support for educational projects, courses and summer schools, both locally and internationally, the ACE Foundation has played a pioneering role in adult and continuing education. The Foundation provides a whole host of educational activities, from worldwide study tours to financial support for a variety of educational projects around the globe. 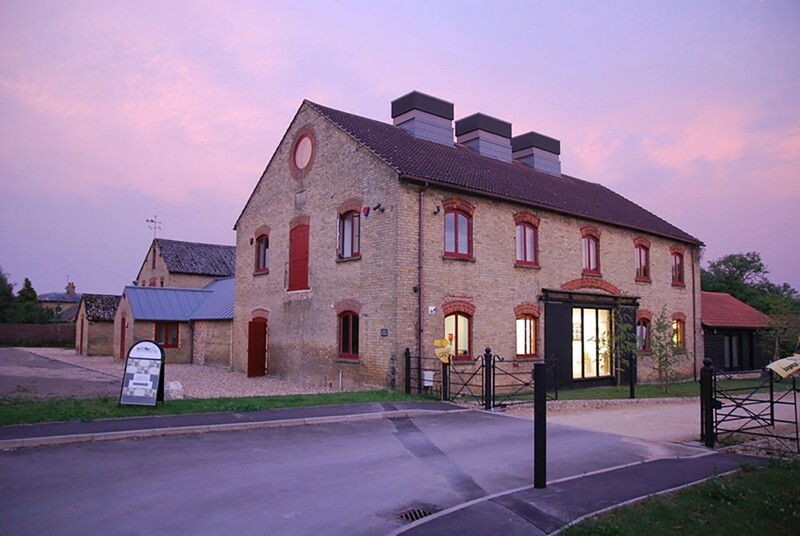 The Foundation purchased a Victorian farm in 2009 on the outskirts of Cambridge with the vision of creating an inspiring space for education, culture, music and the arts. 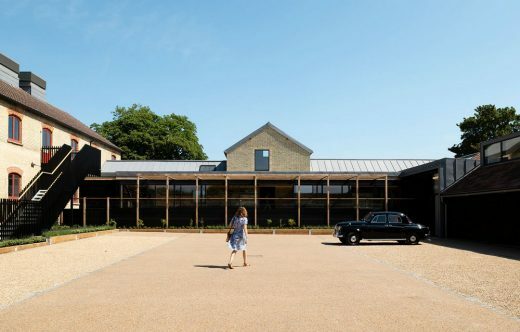 This project has been about creating a home for the Foundation within the precious and characterful setting of the re-energised farm and granary– a place to provide facilities for events and courses, a sustainable working environment for the study tour team and importantly a focal point and accessible amenity for the community both locally and regionally. The first phase of the development saw the granary and immediate outbuildings transformed into a small performance space for 60 people. 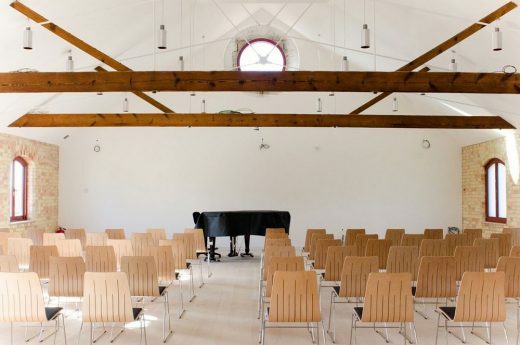 It comprised the granary hall, an outstanding multi-use space for chamber music, lectures and exhibitions; recording facilities; seminar room; and some office space. 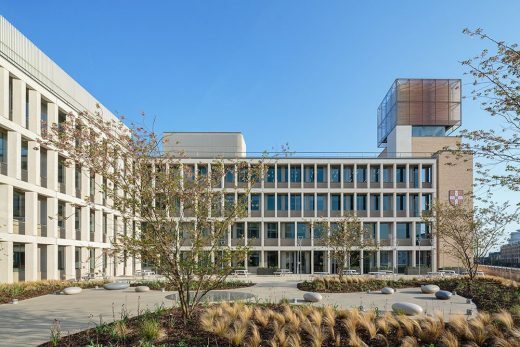 Subsequently, MCW Architects were commissioned to undertake the detail design and implementation of the, £1.5m second phase works to complete the refurbishment and add new build elements to complete the original vision. This now completed second phase has connected the Granary with a new glazed linking structure to an existing barn which has been converted into office space for the ACE Cultural Tours team. 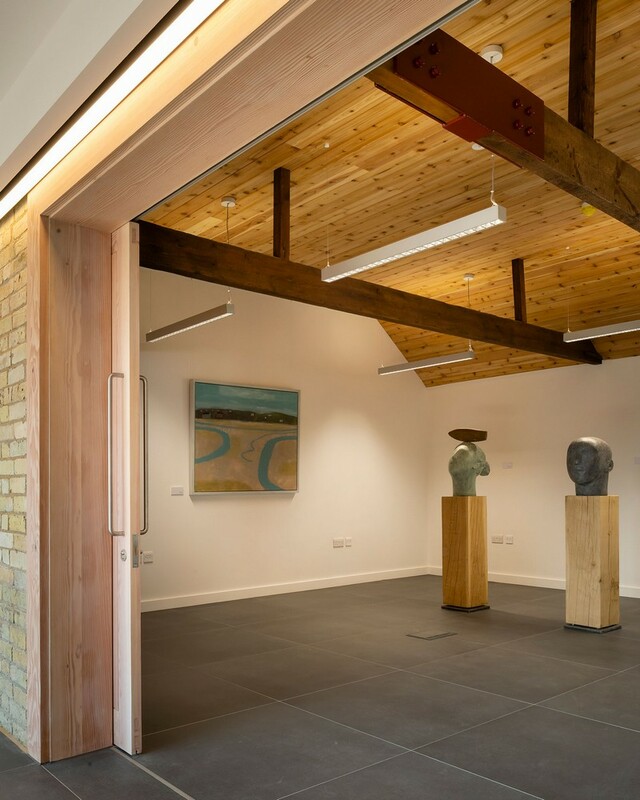 The ground floor of the granary, along with the existing cart lodge, is a creative space for both fine and applied art. 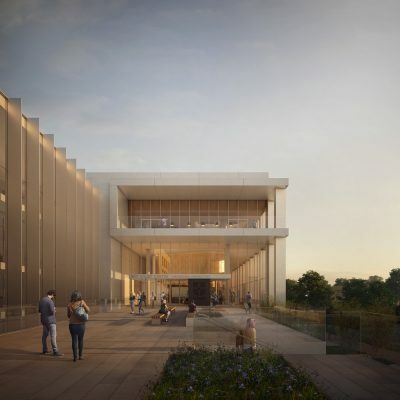 The link acts as a foyer, gathering space and long gallery and opens onto a south facing external terrace – which will be shaded with wisteria ( in 5 years !) on an oak pergola. A new front door opens into a double height lobby which joins office space to foyer. 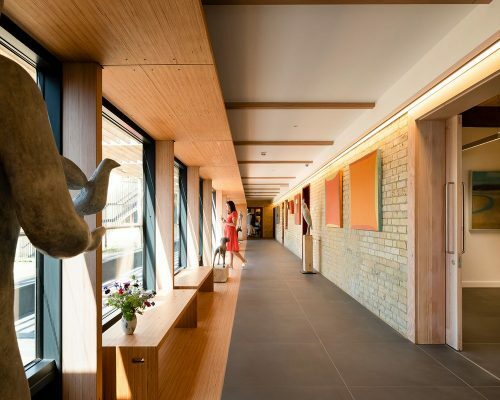 A dilapidated cart lodge has become a space for a ceramics and jewellery studio. 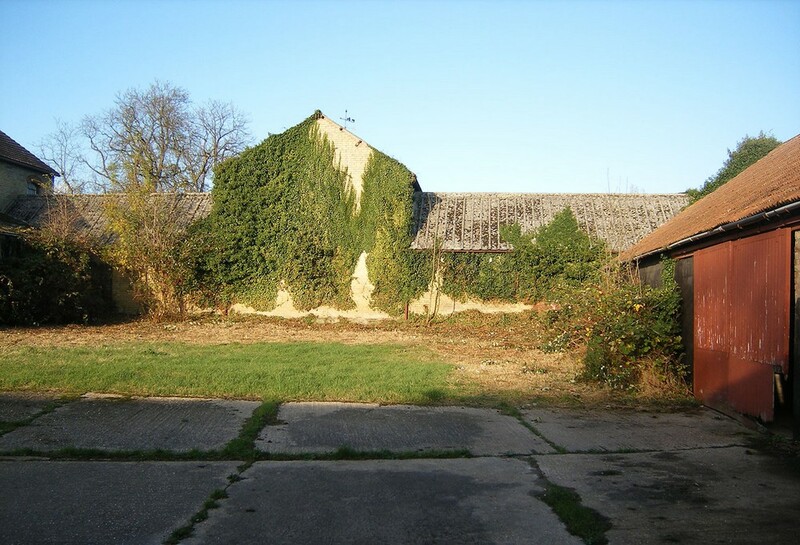 A walled garden will be created beyond the office barn within the original farm yard. 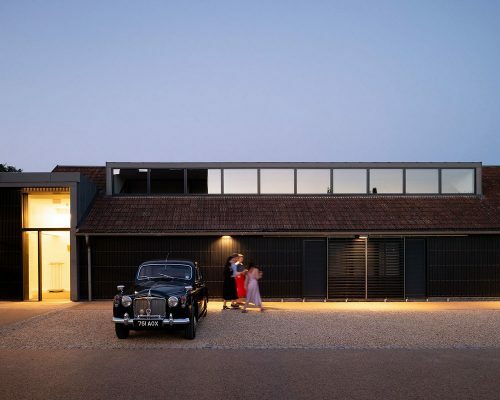 The redevelopment of this sensitive site was carried out in a way that retains the character of the existing fabric and spaces whilst being able to breathe new life into the place so that it can support and sustain the uses and needs of the Foundation into the future use black stained timber and locally sourced brick. Where new window openings were required, the scale and location reflect how they would have been traditionally handled. Pitched roof forms were retained. The aim of the ACE foundation has been to develop an inspiring place, suited to all types of education, where everyone can feel at home. 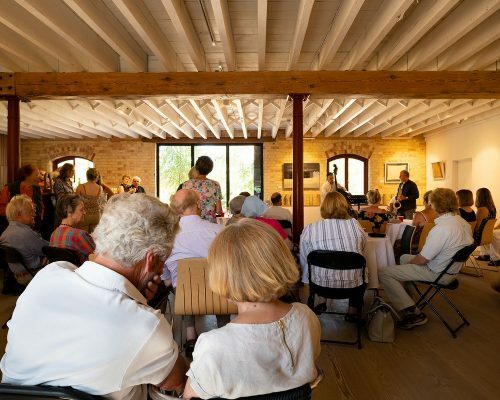 From the outset of this initiative in 2009, the Foundation has involved the local community, continually informing the local villagers of the long-term intent, sharing information on progress and holding consultation events in order to gather comments, ideas and concerns. This wholehearted engagement has resulted in an extremely positive atmosphere and a clear feeling of support from the majority of the immediate village of Stapleford but also the wider connected village communities of Shelford and Pampisford. The formal engagement process has been via local representatives on Stapleford Parish Council. It is significant that, at the recent events to celebrate both the 60th Anniversary of the Foundation and the opening of the second phase worksthe Chairman of the Parish Council requested an opportunity to speak, offering thanks and support to the Foundation for the provision of this facility and acknowledging how such a valuable community asset can improve the lives of those that take part in the activities and events. The concerns of the local community have also been acknowledged and responded to as the project has developed. The location of the primary concert space in the first floor of the old granary brought with it anxiety from adjacent neighbours about noise emissions and disturbance. The design team collaborated with Cambridge based specialist consultancy Breathing Buildings to develop an acoustically attenuated natural ventilation strategy using three vent stack elements that sit along the ridge of the existing building. These allow air in and out without transference of sound from musicians within the space. The original single glazed windows along this face were replaced with specially designed triple glazed units that closely resemble the original format and proportion. Concerns about traffic and parking for events has been taken on board with every event marshalled by volunteers and the negotiation of additional temporary parking in the adjacent working farm. Careful consideration has been given to the building services engineering concepts and integration with the architectural design scheme. 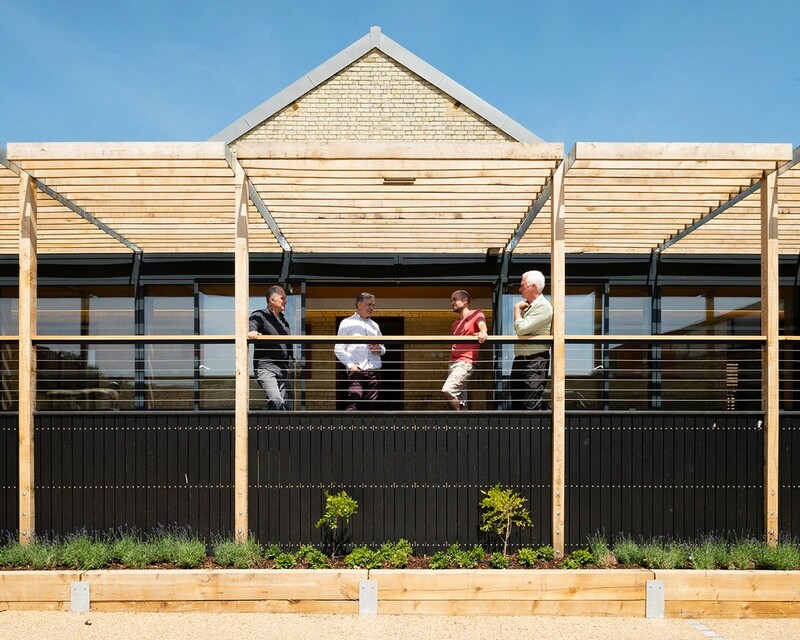 The design strategy acknowledges the environmental criteria for the space and the need to maximise energy efficiency. New services were installed throughout. 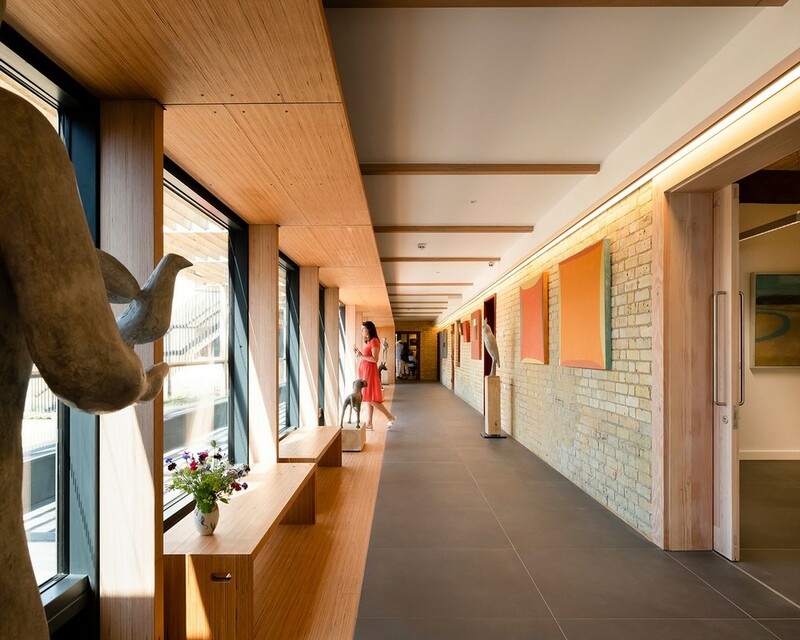 All areas are naturally ventilated with heating provided via an underfloor heating system. Energy efficient lighting was installed throughout. The local planning authority’s conservation team vetoed a roof mounted PV proposal on the grounds that it harmed the heritage asset. 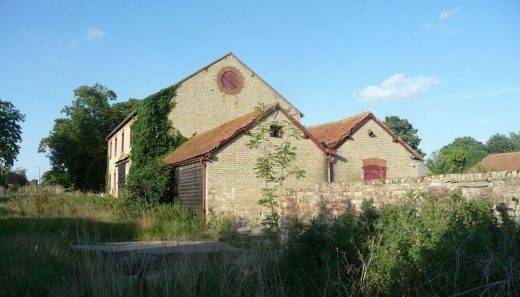 The proposals for the new workspace in the old barn along with the link corridor were based on a computer model using IES simulation software to simulate the performance of the building and inform the design of the natural ventilation system and the building envelope. The Foundation required a solution that did not include any air conditioning systems. 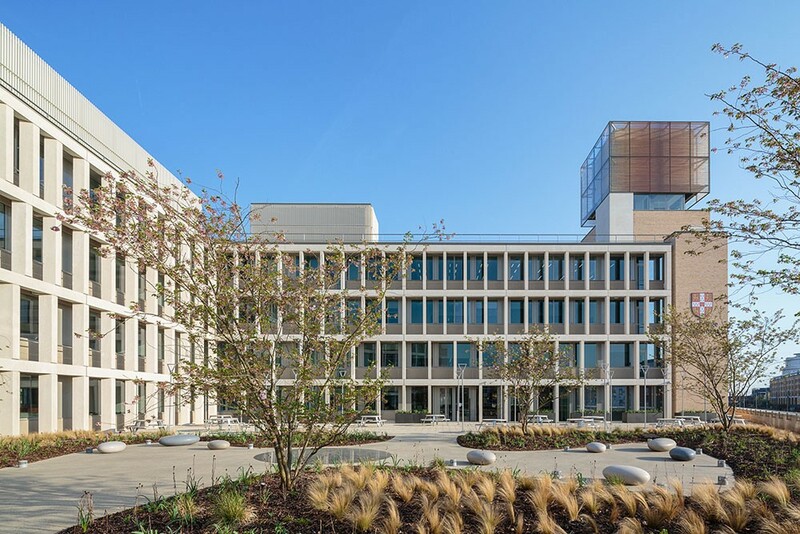 The resultant scheme utilises a series of simple passive components that are operated using a central building management system to work as an effective, connected system. 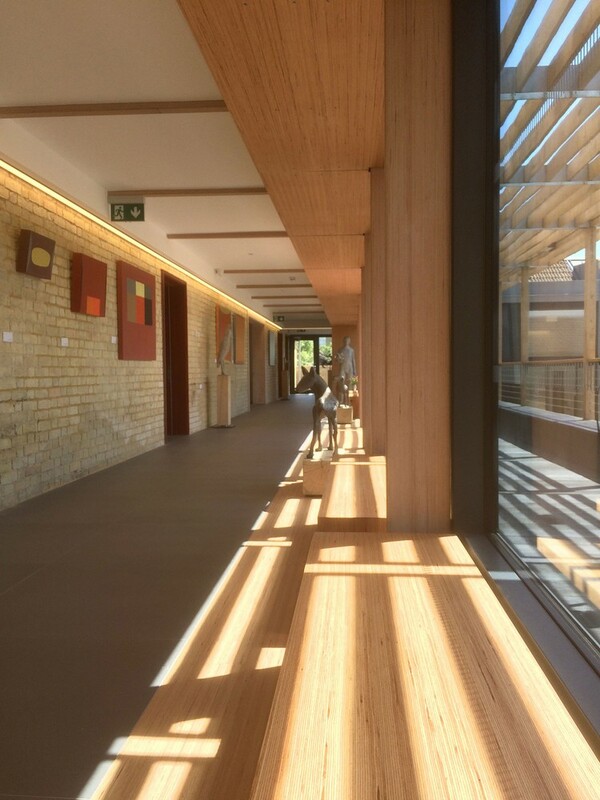 A new full-length roof light has been created across the whole workspace- bringing excellent daylight into the space as well incorporating a series of opening lights that allow warm air to exhaust naturally. These top vents work in conjunction with low level operable louvred air intakes to enable a stack effect of air flow through and across the space. The top vents can be manually opened if required. Night time purging of warm air is managed by the BMS automatically to ensure that the workspace temperature is brought down within the comfort criteria for the next working day. 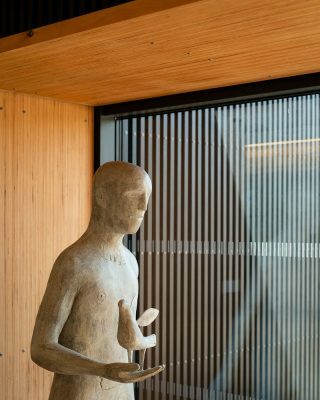 Heater units are incorporated into the low level incoming units to allow winter time fresh air to be preheated as required – again working in conjunction with a complete underfloor heating system. The long gallery/link space is controlled in a similar way – with automatic high and low level vent panels and also manually operated panels. 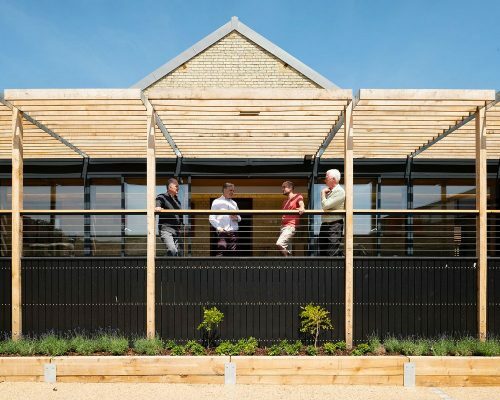 In addition, this space which has a southerly aspect, is shaded by a 3m deep external shading structure. A series of green oak slats will ultimately be covered with a flowering wisteria – providing improved summer time shading and when pruned in the winter – maximum natural daylight. 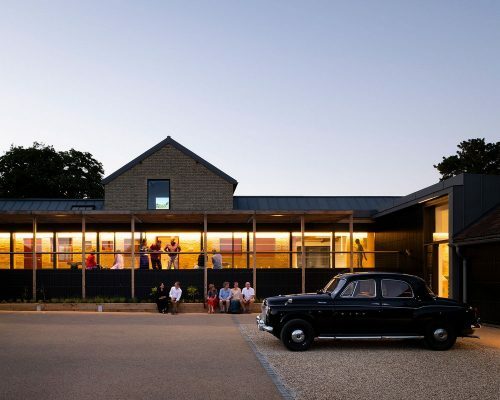 Inclusivity and accessibility was a key consideration for the ACE Foundation, ideas that are at the heart of their mission and to ensure that any events and courses can be attended by all. Despite the historic nature of the existing building the Foundation insisted that a key part of this second phase work was to create a more formal main entrance from the rear court parking area that includes a platform lift to deal with the distinct level change across the site. This arrangement now offers two, separate, level access entry points to the scheme – one to the north and the new southerly point- both with demarcated, accessible parking spaces directly alongside. The new ‘front door’ is motor assisted for ease of access. Two fully accessible toilet facilities are provided along with a shower and baby change space. An additional platform lift was provided within phase 1 to enable access for all to the performance space at first floor within the Granary. 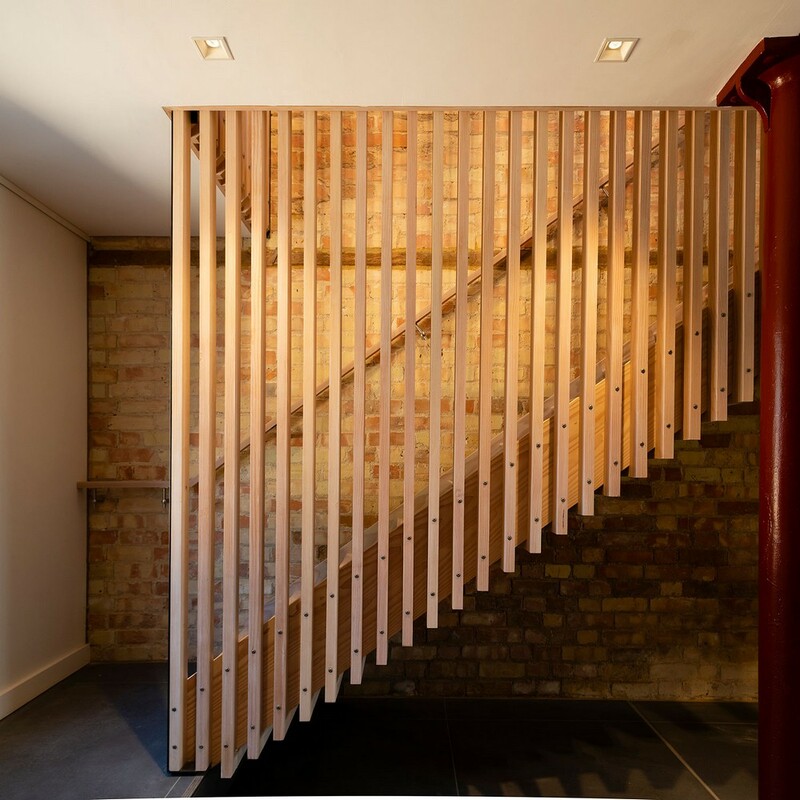 The phase 2 works have also included the creation of a new external escape staircase from the performance space to the courtyard- this has enabled the capacity of the audience to be raised from 60 to 100 for any event at the first floor. Clearly demarcated footpaths with no kerbs and non-polluting light fittings have been made around the perimeter of the building allow safe movement around the site. New open cycle parking has been introduced to the north of the site and a small area of covered cycle parking for approximately 12 cycles is located within the cart lodge range. To encourage local community visitors and staff to travel by bicycle. 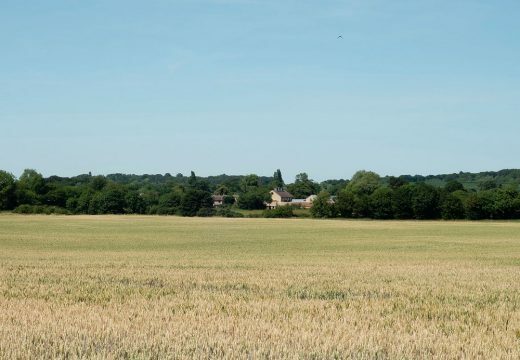 The site was deliberately chosen for its proximity to local bus routes and is a 15 minute walk from Shelford Station on the main line to London Liverpool St.